HFTP Los Angeles currently has a membership of 100+ hospitality professionals. The Chapter holds meetings once a month, generally on the evening of the third Thursday of the month. 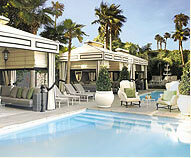 Our meetings are held at various hotels and clubs throughout the L.A. area. Meetings generally begin with a cocktail reception that offers attendees an opportunity to network and share industry news and ideas, followed by a speaker that touches on an industry or educational topic, and a three-course dinner. The Chapter also raises money for a student scholarship fund, hosts social gatherings, contributes to local and national charities, and sponsors a half-day seminar for its members. The Chapter newsletter is published once a month (September-June) to keep members informed of Chapter events, share member news, and pass along valuable information and articles. Want to write an article? Do you want to host or speak at a meeting in the future? Call (626) 836-1222, Fax (626) 836-1223 or drop us a line at lamail@hftp-la.org.